I told my friends Emily and Phil and we decided we had to make them. I am so glad we did! I have been slowly munching on them ever since. I am trying to make them last, because they are just too good to scarf down. 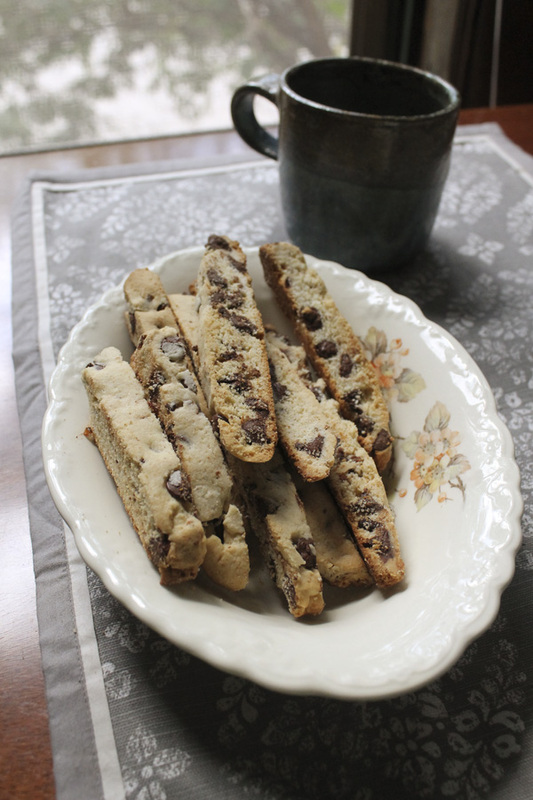 I can’t be making biscotti every day! This recipe is super simple. 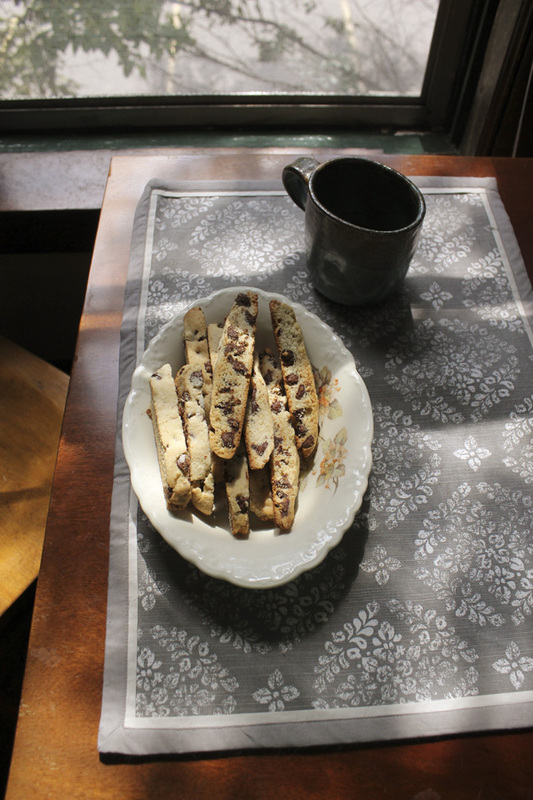 For some reason I thought biscotti would be hard to make. Well, I was wrong. I strongly recommend this recipe! If you try it let me know. I would love to know how it turns out for you. Oh and that’s Mimi, my baby kitty. You will be properly introduced soon. I promise! 1. Fry bacon until browned and crisp. Don’t toss the bacon grease just yet. You need it later! Transfer to paper towel-lined plate to drain. Once the bacon is cool put it in the food processor and pulse until coarsely chopped. 2. Whisk flour, baking powder, and salt together. In a separate bowl cream butter and sugar with a mixer. Add the eggs one at a time to the butter and sugar mixture and beat until well blended. Stir in bacon and chocolate chips. Divide the dough in half and wrap in plastic. Place in the refrigerator for 20-30 minutes or until firm. 3. Use bacon grease to grease the pan. Preheat the oven to 350 degrees F. On a floured surface, roll each piece of dough to 12 to 14 inch log. Place the logs on a baking sheet. Bake until lightly golden and dry to the touch, about 30 minutes. 4. Remove baking sheet from oven. Reduce oven temperature to 300 degrees F. Let the logs cool for about 15 minutes. Next cut the logs into 1/2 inch thick slices. Return slices to baking sheet with the cut edges down. 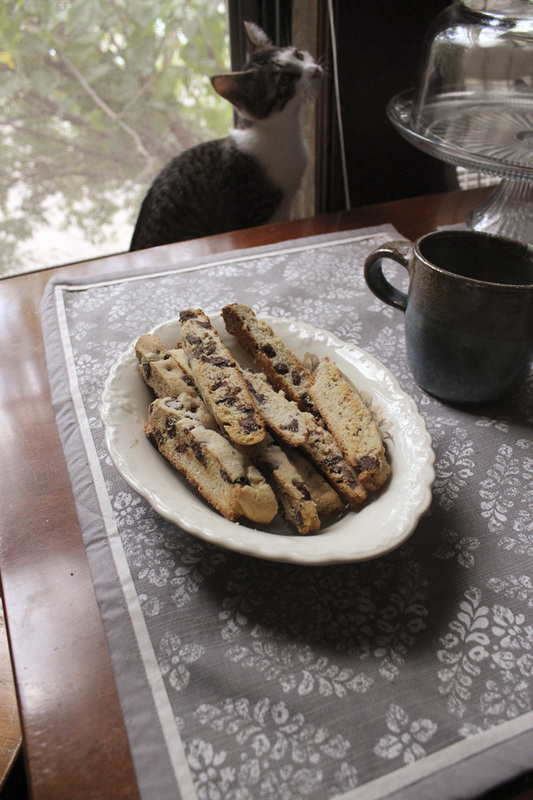 Bake for 15 minutes then turn the strips of biscotti and bake for another 15 minutes. Bacon and chocolate are the best! I made muffins out of them once.